At the end of the first post on my Matrioshka build, I'd finished gluing up the 'ends' as I think of them for each of the puzzle pieces. I still hadn't cut out the centre sections (or as I'm referring to them, the bridges) that join the two ends of each puzzle piece together, and I still had a lot of sanding to do so that the pieces were all the same size. In this second part, I go through that process, and get closer to the finished puzzle. On a side note, I originally referred to this project as a MaTRIOshka, however what I'm actually building is a single layer of Vin&Co's puzzle. Stewart Coffin originally referred to this assembly in "The Puzzling World of Polyhedral Dissections", which I have been reading recently as the Expanding Box puzzle. There Mr. Coffin refers to this as a curiosity more than a puzzle, but I'm going to continue on none the less with this build. It is helping me learn about puzzle creation and improve my skills, although I dare say that as with most puzzle creators early works, this will be less than impressive. The bottom line is that it is still a nice co-ordinate motion puzzle. With 12 'ends' all glued together, I had quite a task to remove all the excess glue from the pieces, and sand them all down to a nice smooth finish. I had deliberately left the pieces slightly larger than they would be for the final glue-up, so that I had some room for cutting errors and the like. 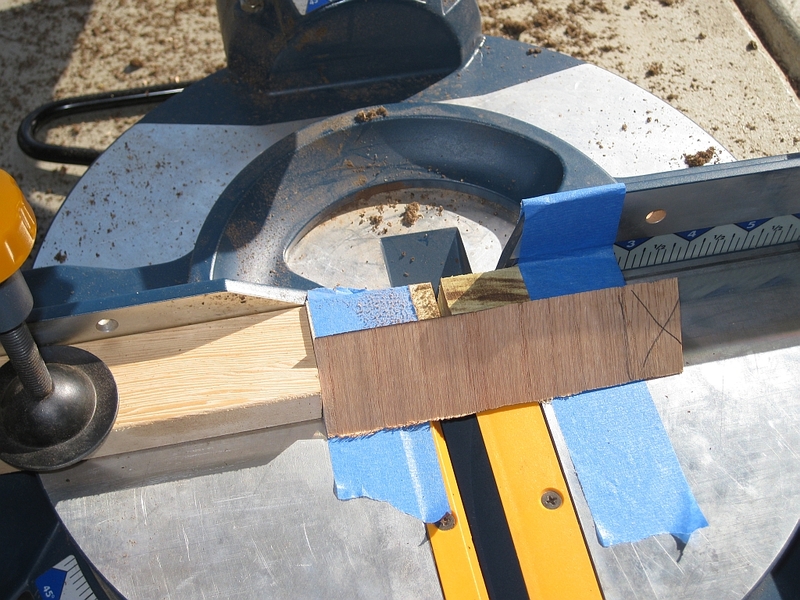 This is fairly standard, as it's easier to correct for problems with your saw being slightly off, or gluing issues when you have a little extra material to work with. 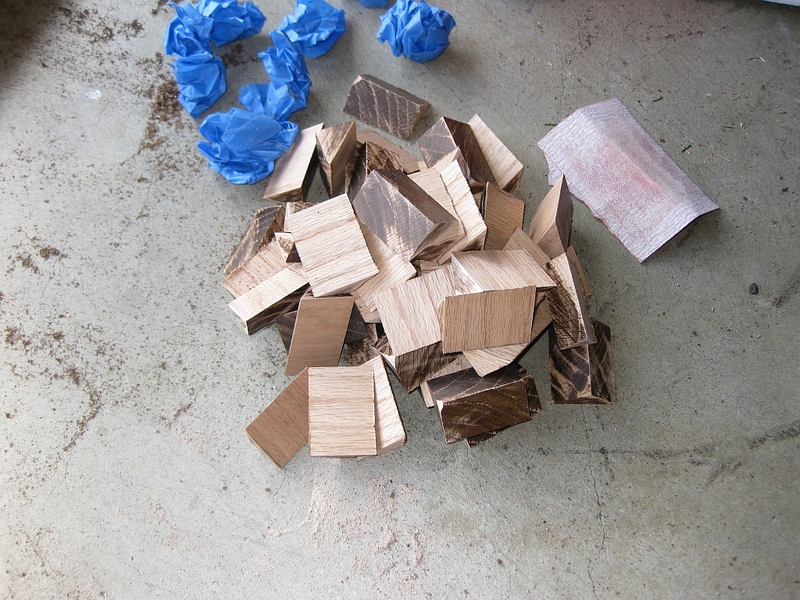 Puzzle Pieces before sanding - not pretty! If you're wondering about the interesting pattern in the dry glue, this is because I'm using plastic wrap to prevent glue getting onto my clamps. 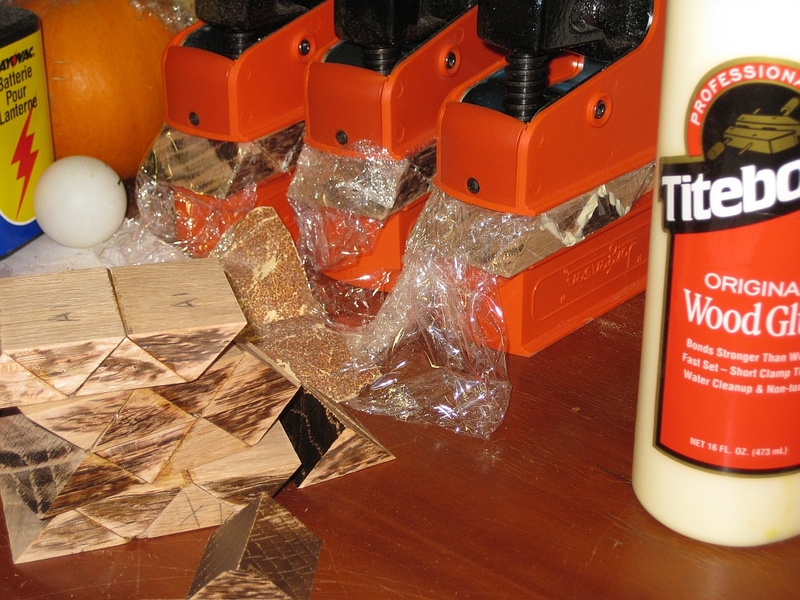 It's effective at keeping the glue where it needs to be, but until I build some gluing jigs, I'm left with this sort of mess. 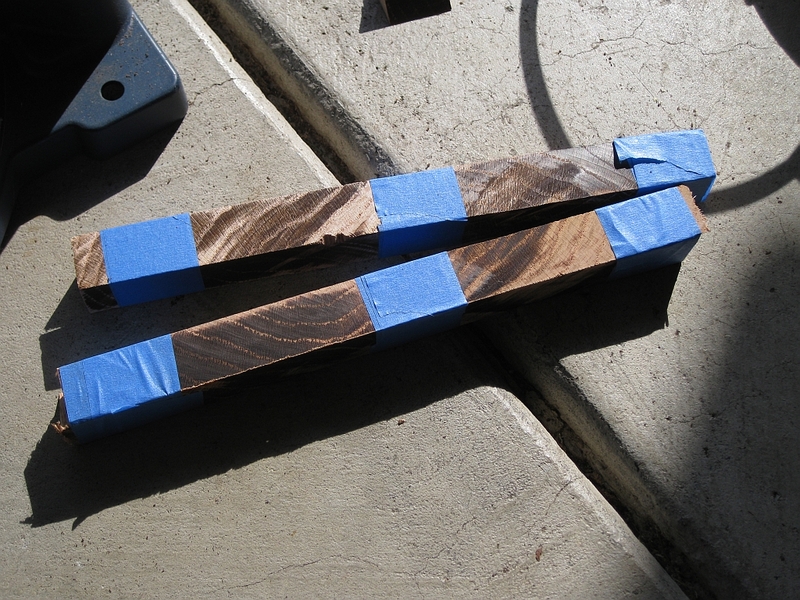 As yet I still hadn't cut any wood for the join between each end of the piece. 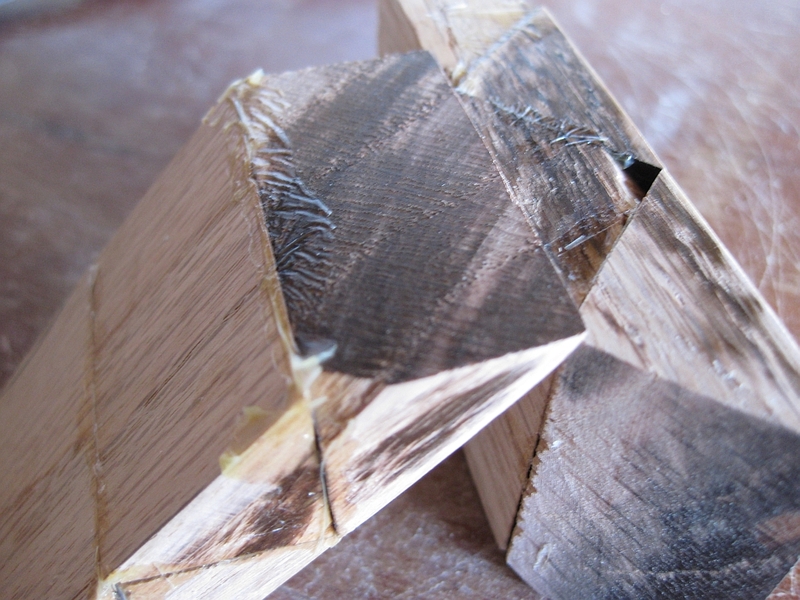 I'll be honest here, I still hadn't entirely figured out how these should be cut, the angles required on the cut etc. 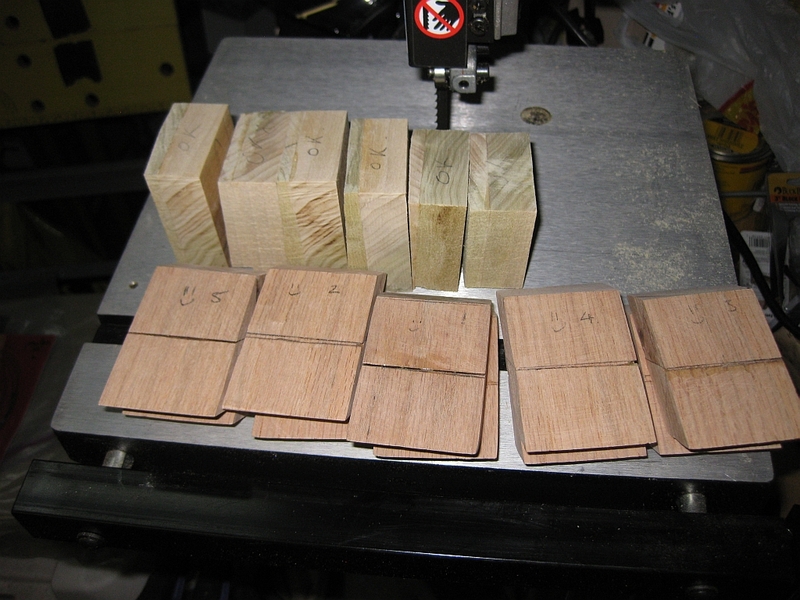 As I have learned, I cut close to my lines, but didn't go over, to allow me to sand the pieces to the perfect size. You may notice from the image, that my lines are not in pencil Given the accuracy of the cuts I wanted, I used a hobby knife to make the lines. This gives a much more accurate line than pencil, since the edge is much thinner, and also helps to prevent tearout by severing the ends of the fibres if you're working across the grain. 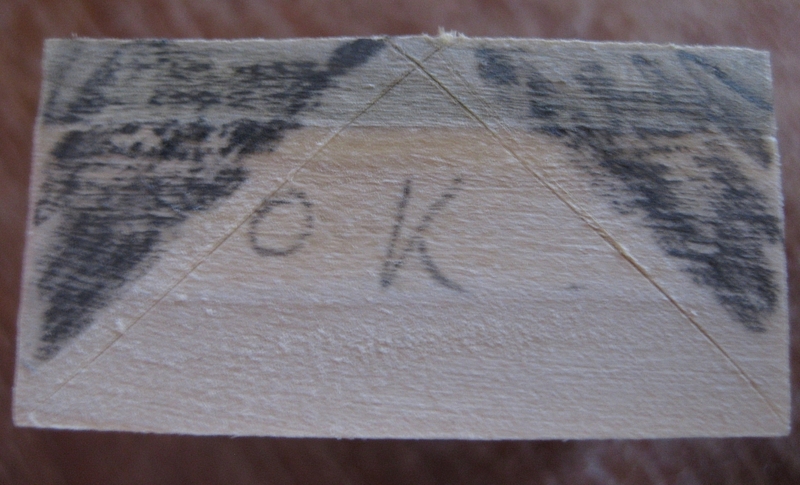 Yes, these marks are in end grain so it's not helping me here, but I though it worth mentioning. Note: If you've not figured it out already, all the images I upload are at least twice the size you see here. Click the image to see the full size version, and to browse all images for this blog entry. 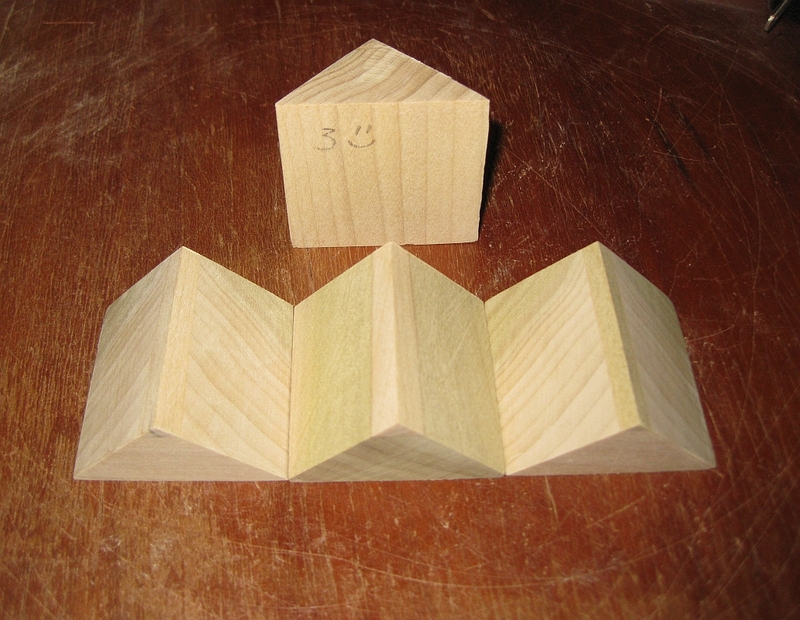 The result was six identical pieces which would form the bridge between each end of each puzzle piece. So far, so good. Now the interesting thing I found out taking this approach, and working purely from pictures, is that the piece required for the bridge is a standard triangular cross-section, the same as the rest of the pieces in the puzzle. The only difference is that the bridge is slightly taller than the end pieces. Going back to Coffin's book, this is exactly what he shows, so this was confirmation that I had this right. In the next part, I'll look at tackling the problem of gluing up the final pieces and seeing if this thing actually works. On a side note, I have my copy of Vinco's Matrioshka now, and the puzzle I'm building is large enough that the Matrioshka will fit inside it. So does this mean I'm actually building a Quadrioshka? I've had a request sent to me about making puzzles from Lego, so I thought rather than reply to the person individually, I'd throw something up here, so that everyone can benefit. I already commented in a previous post that LiveCube was a possibly way to create Burr puzzles, however as I already mentioned, they are not as easily available, and from what I have been told, when you add shipping from the US it's a rather expensive way to go. Given this, I was asked what Bricks and plates you'd need to be able to create Burr puzzles from Lego. This post is my attempt to answer that. I should say, that there are many ways to go about creating a burr piece. There are a lot of Lego designers out there who are far better than I am, however at it's simplest, the process is fairly easy. The first problem we have to overcome is that a brick is not a cube, as you can see here. So to make it square, we need to add a couple of plates. Now the type of plate we add depends on whether the piece is going to form part of the Burr body, or the top of the Burr. For an 'internal' piece, we use a standard plate. For the top we use a 'tile with groove'. The images below show the two pieces we will use. Now that we have the basic pieces, how do we make a cube? 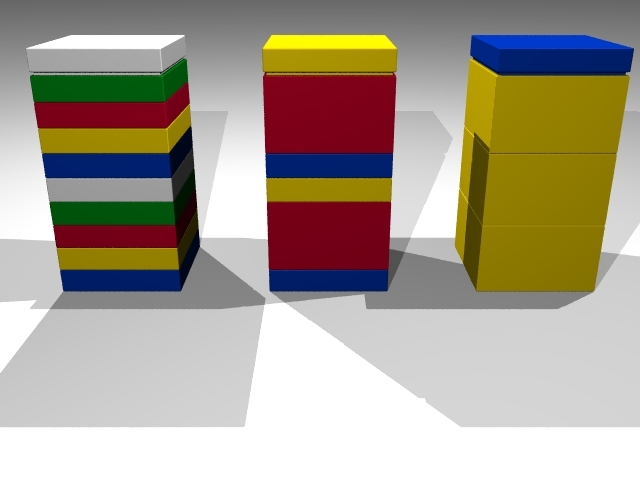 Well the dimensions of a lego brick 'cube' are 5x5x3. 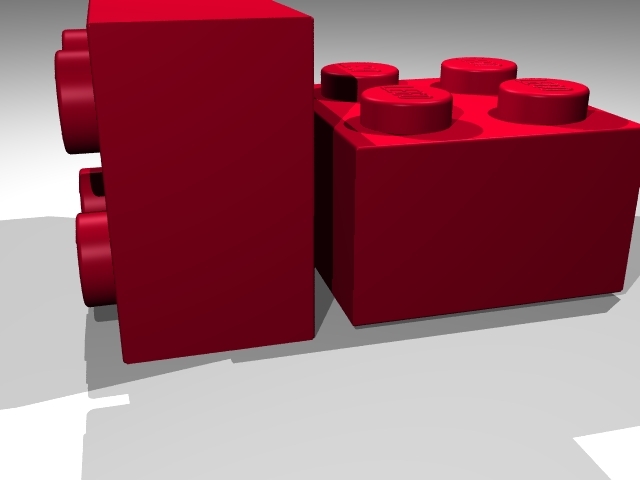 Each stud on a Lego brick represents 2.5 units. Each plate is 1 unit high. So to get a cube, we need one brick and two plates. So as you can see, the height now matches the width, and we have a cube. 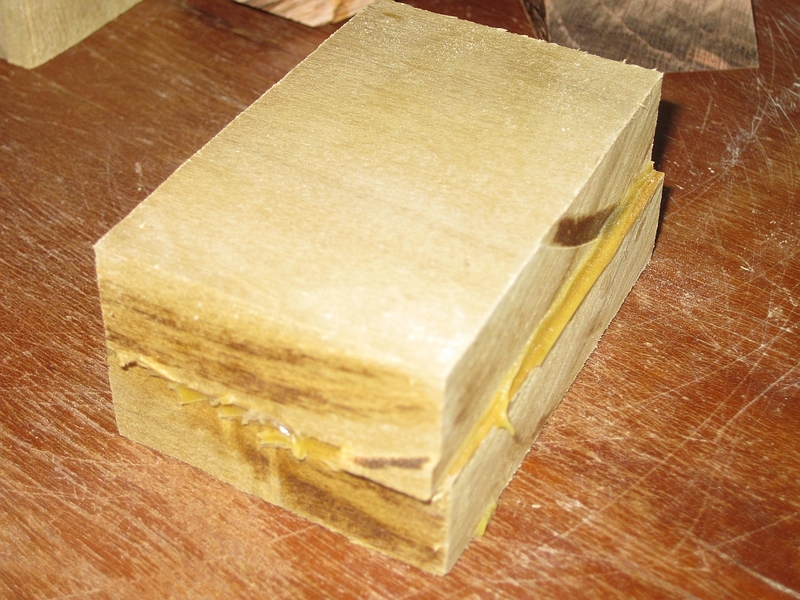 Building up Burr pieces is fairly simple from this point. 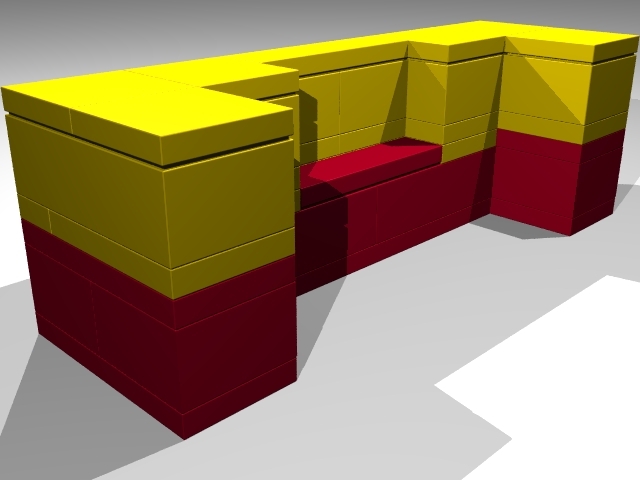 Take the piece you want to build, and using those dimensions, create the part in Lego. Having longer bricks and plates does help to make the whole thing more stable, as long as you remember that each brick requires 2 plates to make it square then you'll be fine. Of course, if you think about the height of 2 bricks, that's 10 units. You can make that from 3 bricks and 1 plate or 2 bricks and 4 plates, or 10 plates. The skill comes in working out how to get the tiles in the right place so that you have smooth surfaces on the top of each Burr piece. 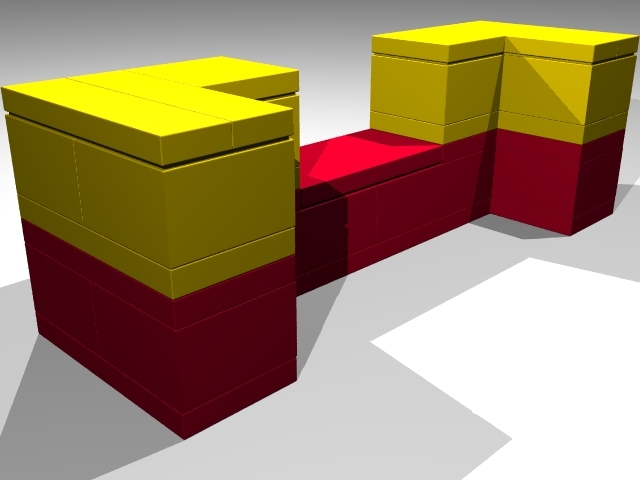 Equally, the piece made from 3 bricks and one tile has far less pieces, and by definition less joins, so should be more stable. That's not always true however , as the thin plates have a greater surface area per thickness, so don't 'bend' as easily! 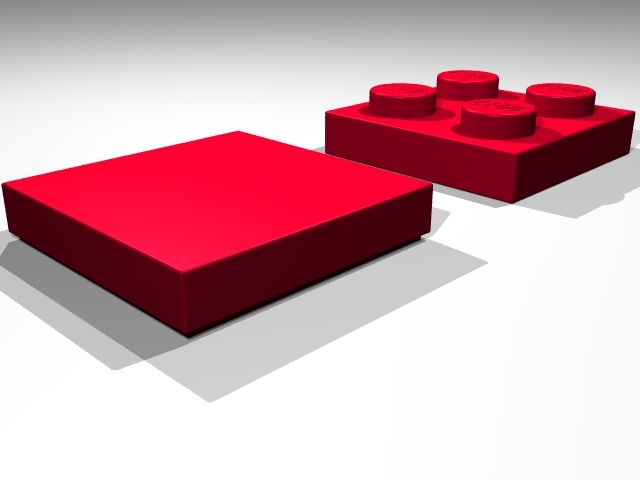 The example below shows a basic Burr piece made from Lego. So that covers the basic burr parts. What happens when we need a half sized wall? Well it's fairly simple, we just use a 1x2 brick and plates. The part above is modified to give a more complex piece just to show the difference. So from that you should have the basics. I highly recommend getting LDraw, there's a link under Puzzle Creation tools, and also a GUI designer such as MLCad for Windows or Bricksmith for Mac. There a good tutorials on using these on the LDraw website. The tools will help you to build the pieces ahead of time, and work out how best to build each piece. 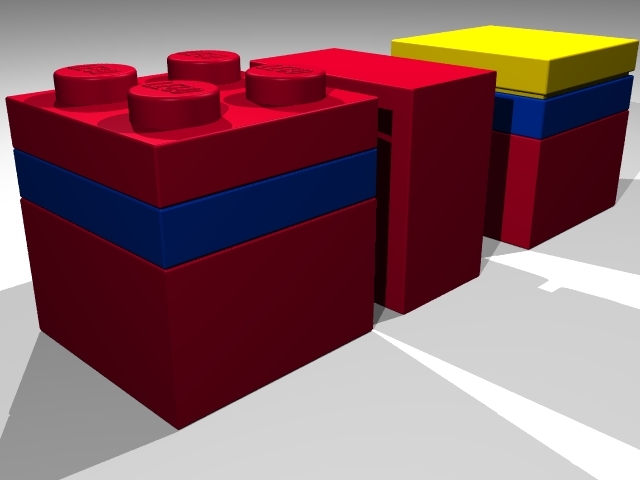 It can make things quicker, depending on how familiar you are with building in Lego. If I'm honest, most of the time, I build it in Lego first, and come back to LDraw later!